The sea lions stop bellowing and slip, one by one, off the jetty into the mocha-brown water of the Fraser River, near Vancouver, British Columbia. The surface of the water is smooth, except for a line of ripples moving slowly upriver. The sea lions seem to know that the calm surface belies turmoil beneath. The tide has just turned, and a tongue of salt water is first creeping, then galloping, back into the Fraser just a few hours after being expelled by a strong outflow during the previous ebb. Although the surface appears calm, the underwater intersection of fresh and salt water roils with turbulent eddies as strong as any in the ocean. The confusion of swirling water and suspended sediments disorients homeward-bound salmon, providing an easy feast for the sea lions. Not all rivers end as dramatically as the Fraser. But the mixing of freshwater streams and rivers with salty ocean tides in a partly enclosed body of water—natural scientists call it an estuary—fuels some of the most productive ecosystems on Earth, and also some of the most vulnerable. Long before the advent of civilization, early humans recognized the bounty of the estuary and made these regions a focal point for human habitation. Unfortunately, overdevelopment, poor land use, and centuries of industrial contamination have taken a toll on most estuaries. Boston Harbor, San Francisco Bay, and the Hudson River are poster children for environmental degradation. Yet there is hope. Estuaries are the borderlands between salt- and freshwater environments, and they are incredibly diverse both biologically and physically. The diversity and the high energy of the ecosystem make estuaries remarkably resilient. With a better understanding of these systems, we can reverse their decline and restore the ecological richness of these valuable, albeit muddy, environments. How does an estuary work? From a physicist’s point of view, the density difference between fresh and salt water makes estuaries interesting. When river water meets sea water, the lighter fresh water rises up and over the denser salt water. Sea water noses into the estuary beneath the outflowing river water, pushing its way upstream along the bottom. 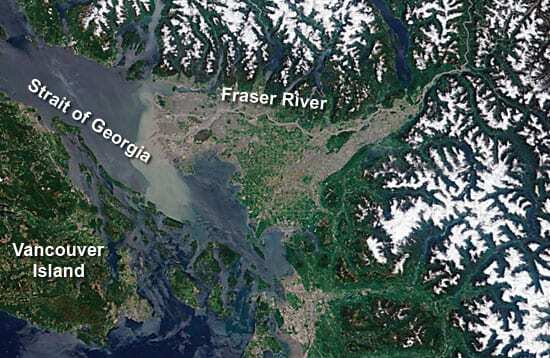 Often, as in the Fraser River, this occurs at an abrupt salt front. Across such a front, the salt content (salinity) and density may change from oceanic to fresh in just a few tens of meters horizontally and as little as a meter vertically. Accompanying these strong salinity and density gradients are large vertical changes in current direction and strength. You can’t see these swirling waters from the surface, but a fisherman may find that his net takes on a life of its own when he lowers it into seemingly placid water. The opposing fresh and saltwater streams sometimes flow smoothly, one above the other. But when the velocity difference reaches a certain threshold, vigorous turbulence results, and the salt and fresh water are mixed. Tidal currents, which act independently of estuarine circulation, also add to the turbulence, mixing the salt and fresh waters to produce brackish water in the estuary. In the Fraser River, this circulation is confined to a very short and energetic frontal zone near the mouth, sometimes only several hundred meters long. In other estuaries, such as San Francisco Bay, the Chesapeake Bay, or the Hudson River, the salt front and accompanying estuarine circulation extend inland for many miles. The landward intrusion of salt is carefully monitored by engineers because of the potential consequences to water supplies if the salt intrusion extends too far. For instance, the city of Poughkeepsie, N.Y., 60 miles north of the mouth of the Hudson River, depends on the river for its drinking water. Roughly once per decade, drought conditions cause the salt intrusion to approach the Poughkeepsie freshwater intake. The last time this happened, in 1995, extra water had to be spilled from dams upstream to keep the salt front from becoming a public health hazard. Estuarine circulation serves a valuable, ecological function. The continual bottom flow provides an effective ventilation system, drawing in new oceanic water and expelling brackish water. If it weren’t for this natural “flushing” process, the waters of the estuary would become stagnant, pollution would accumulate, and oxygen would be depleted. This circulation system leads to incredible ecological productivity. Nutrients and dissolved oxygen are continually resupplied from the ocean, and wastes are expelled in the surface waters. This pumping action leads to some of the highest growth rates of microscopic plants (researchers call it “primary production”) in any marine environment. This teeming population of plankton provides a base for diverse and valuable food webs, fueling the growth of some of our most prized fish, birds, and mammals—salmon, striped bass, great blue heron, bald eagles, seals, and otters, to name a few. The vigor of the circulation depends in part on the supply of river water to push the salt water back. The San Francisco Bay area has become a center of controversy in recent years because there are many interests competing for the fresh water flowing into the Bay—principally agriculture and urban water supplies extending to Southern California. Environmentalists are determined that San Francisco Bay should get “its share” of the fresh water coming from the Sacramento-San Joachim delta because the vast freshwater habitats in the region are particularly vulnerable to salt intrusion. Estuaries have their problems. Some are self-inflicted; some are caused by the abuses of human habitation. An estuary, with all of its dynamic stirrings, has one attribute that promotes its own destruction: It traps sediment. When suspended mud and solids from a river enter the estuary, they encounter the salt front. Unlike fresh water, which rides up and over the saline layer, the sediment falls out of the surface layer into the denser, saltier layer of water moving into the estuary. As it drops, it gets trapped and accumulates on the bottom. Slowly, the estuary grows muddier and muddier, shallower and shallower. Occasionally a major flood will push the salt right out of the estuary, carrying the muddy sediment along with it. 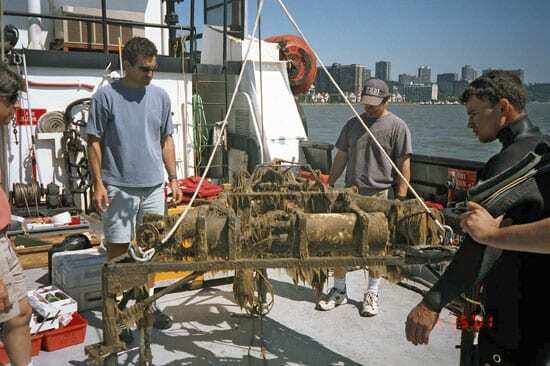 Sediment cores in the Hudson River indicate that sediment may accumulate for 10, 20, or even 50 years, laying down layers every year like tree rings. But then a hurricane or big snowmelt floods the river, wipes out the layers of sediment, and sends the mud out to sea. The “episodic” behavior of sediment deposition is good news and bad news. It is good because a big storm can keep an estuary from getting too shallow too fast. In fact, it appears that over the last 6,000 years, the natural dredging by large storms has maintained nearly constant water depth in the Hudson estuary. The bad news is that the sediment retains a “memory” of all of the contaminants that have passed through it over the years. Environmental regulations are far stricter now than they were 50 years ago, and we have stopped using many chemicals that play havoc with the environment. For instance, polychlorinated biphenyls (PCBs) were banned in the 1970s because they were shown to be toxic to fish and wildlife, and to the humans who consume them. Yet we still have a contamination problem in the Hudson and other rivers because PCBs are slow to decay and each new flood remobilizes these “legacy” contaminants and prolongs our exposure. Billions of dollars are now being spent to clean up American estuaries contaminated by industrial pollution. In Boston, for instance, the new sewage system created to save Boston Harbor cost taxpayers about $5 billion. The Superfund program of the U.S. Environmental Protection Agency collects and spends billions of dollars more to remediate estuaries. Often the remediation strategies are complex and controversial. 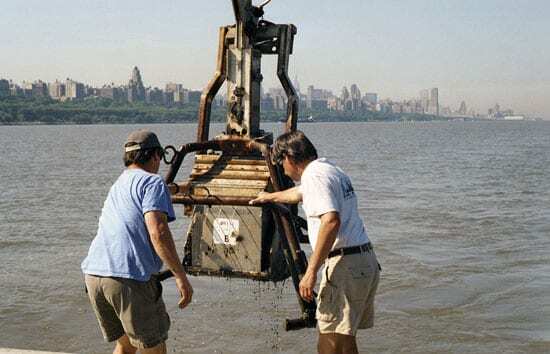 In the case of Hudson River, there is a heated debate about whether PCB-contaminated sediments should be removed—dredged with high-tech methods that theoretically minimize environmental harm—or left undisturbed. That debate pivots on the episodic storm phenomenon: Are the contaminated sediments there to stay, or could they get stirred up when the next hurricane washes through the Hudson Valley? Aside from cleanup initiatives, parts of the Hudson need to be dredged for navigational purposes. Dredging is not that costly or difficult, but finding a place to put contaminated sediments is a problem. The Port of New York has been filling up abandoned Pennsylvania coal mines with its contaminated mud, but that is not a long-term solution. While the problems of American estuaries are complicated and expensive, they pale in comparison to Asian estuaries. The entire nation of Bangladesh lies within the estuary and lower floodplain of the Ganges-Brahmaputra River. Other Asian rivers such as the Mekong, Chiang Jiang (or Yangtze), and Huang Ho (or Yellow River) are crowded and strained by concentrated human settlements. Global sea-level rise is causing a loss of land, increased flooding, and increased salt intrusion in these estuaries. The demand for water upstream for irrigation and domestic use significantly reduces freshwater flow through these systems. The Indus River and Huang Ho estuaries have suffered from drastic reductions of freshwater flow over the past several decades, and the impact of these human alterations is just now being recognized. New policies about land use, water diversion, and even global carbon dioxide production (which affects global warming and sea level rise) will be needed to protect these vulnerable estuarine environments and their human inhabitants. One of the challenges of estuarine research is that most of the significant problems are interdisciplinary, involving physics, biology, chemistry, geology, and often public policy and economics. Estuaries are also incredibly diverse, coming in all shapes and sizes. Yet scientists are continually challenged by public policymakers to generalize our results from studies of one estuary and apply them to the rest of the world’s estuaries. As scientists, one of our roles is to predict changes in the environment, given different natural and human-induced influences. To foresee the health of estuaries in the future, we have some fundamental questions to answer about the present and the past. How far will salt intrude if river flow is cut in half? Do changes in river flow increase or decrease the rate at which sediments shoal the estuary? What effect do such changes have on the fish that spawn in fresh water? What we learn will be critical for a human population that increasingly values coastal waters. We need sound public policy to reduce vulnerability to coastal flooding and to protect drinking water, food supplies, and some of the world’s most important habitats. We will develop better policies only if we can ground them in better science. 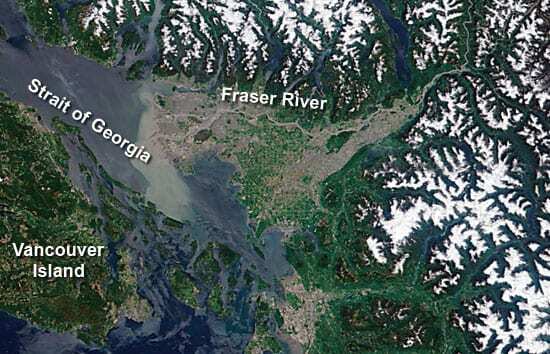 A COASTAL MIXING BOWL— Nutrient- and sediment-laden fresh water from the Fraser River in British Columbia rides up and over salty ocean waters, which are beginning to march upriver during flood tide. The interaction of the two water masses of different salinities and densities in the estuary creates underwater turbulence and mixing that naturally flushes and energizes the coastal system.